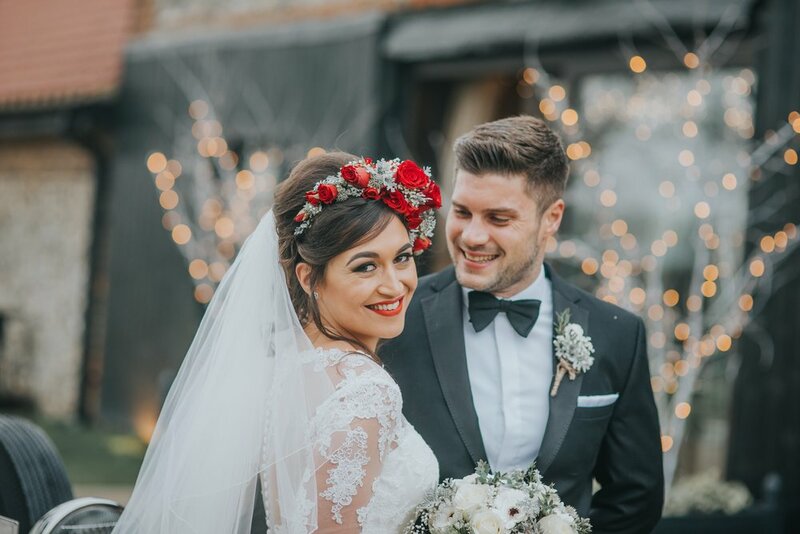 We love a Winter wedding here at the barns and instantly fell in love with this couple and their vision last December. 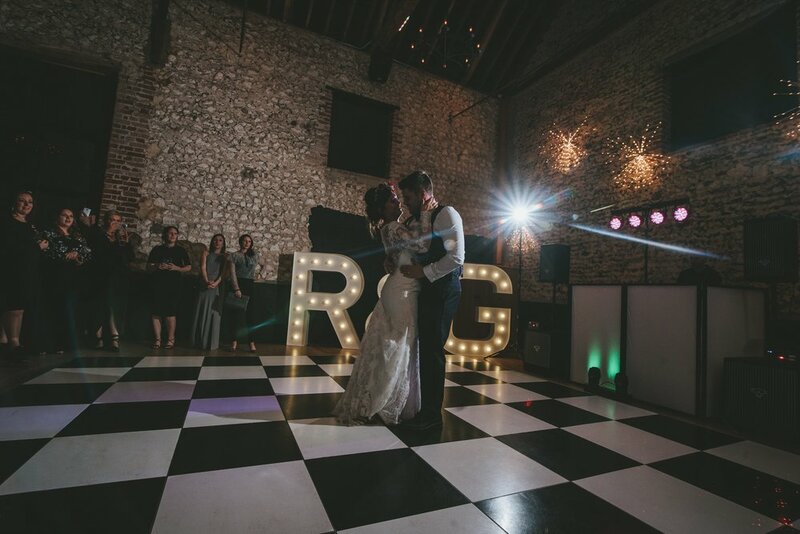 Rio and Grant knew that they wanted a wedding around Christmas time with lots of greenery, hessian and candle light; the perfect rustic theme for our Granary Barn. 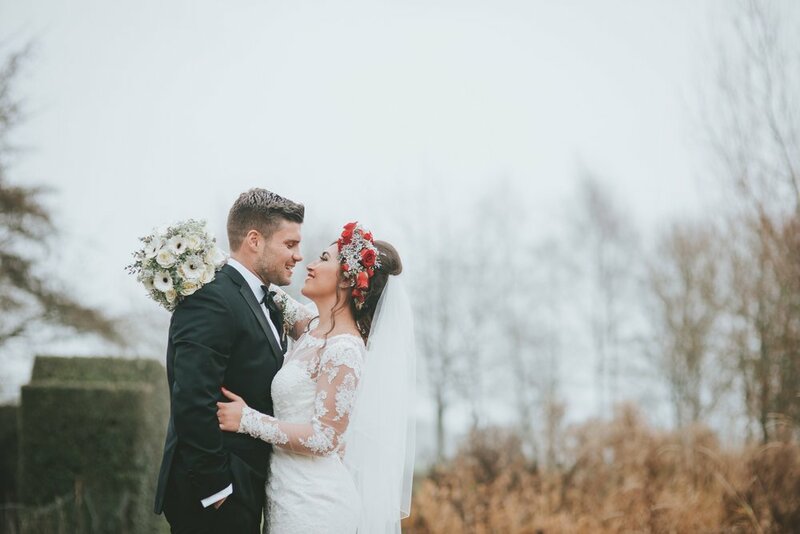 With unique decorative features and a wonderfully festive theme throughout, this couple created a stunning wedding day captured beautifully by the talented Tom Halliday. Check out the bridesmaid dresses and stunning bursts of red in Rio's flower crown and lip colour...gorgeous! I always imagined myself having a big princess dress but I ended up having the opposite. The first day I went to try dresses on I tried on my dress & thought it was beautiful but quickly moved on to others not taking much notice of it. I ended up putting a deposit down on another dress that was completely different, a princess dress. 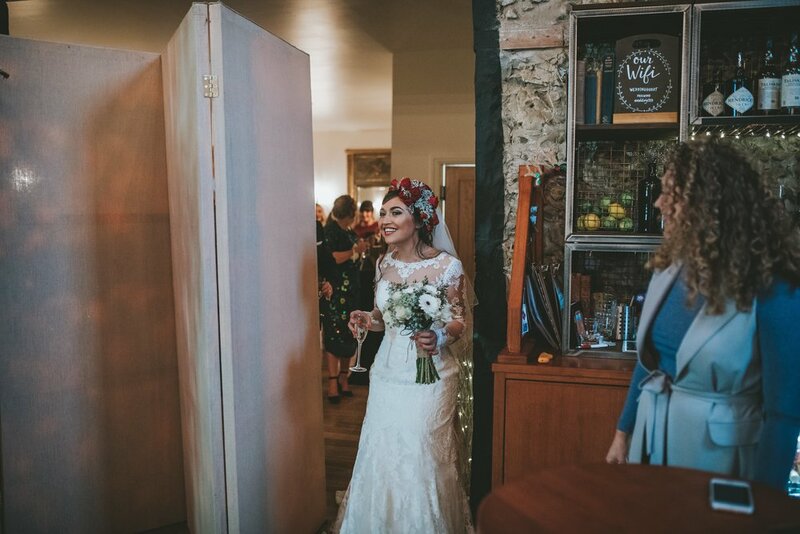 Over the next few weeks I kept looking at photos & just didn’t think it was ‘the one’ so I went back to Bride All in Exning & Lynne & the team were brilliant & let me try on lots more dresses. When I came back to my dress I knew then it was the right one & couldn’t believe I didn’t choose it in the first place. I absolutely loved the detail on the back of the dress & the long lace sleeves. 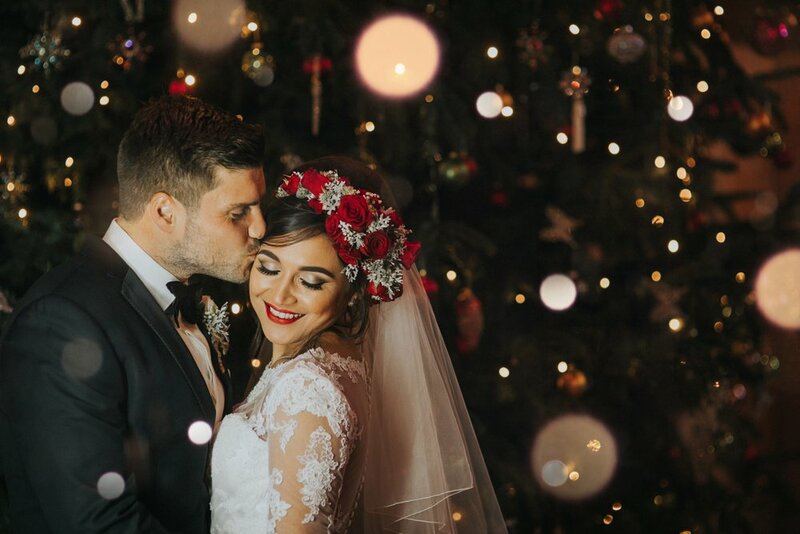 It was perfect for my winter wedding. On our wedding morning Grant had bought me a gorgeous pair of Pandora earrings that I wore, my bridesmaids had got me a garter from The Wedding Garter Company as my something blue & my parents bought me a Tiffany horse shoe necklace for good luck which I wore too. 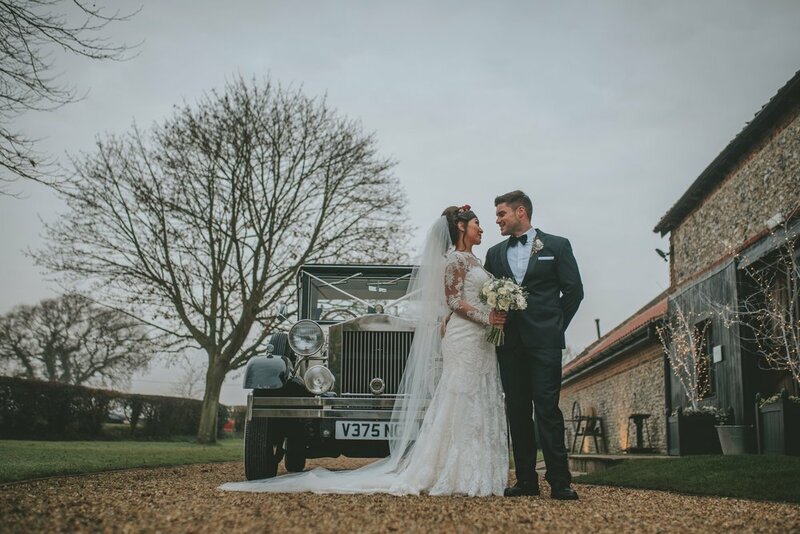 I had Jenny Packham heels & a plain floor length vail which made me feel like a real bride. Grant, the groomsmen, Grant’s stepdad & my Dad all wore the same dinner suits which we hired from Moss Bros in Cambridge. We bought each of them a pair of silver cufflinks to wear too, personalised with their initials on. My Dad’s cufflinks had ‘Father of the Bride’ & ‘I loved her first’ on & Grant’s had our wedding date & the name of our first dance song ‘Let’s Stay Together’ on the other. I wanted Grant to look a little different from the others so he also wore a half moon black velvet waistcoat from ASOS to make his suit a 3 piece & he wore black brogues from Dune. I also bought him a brooch containing a picture of his late father in which he wore on the inside of his jacket throughout our day. Originally I wanted the men to wear tweed suits but it was Grant who chose the dinner suits & insisted on having them. I am so glad he did as I think they looked so smart & matched the winter wedding theme perfectly. I had 4 bridesmaids, my 3 best friends & my little sister. They are all gorgeous girls with lovely figures so it was easy to find a dress to suit them all. I ended up choosing their dresses from Chi Chi London. They were backless & had long lace sleeves similar to my dress. I wanted the girls to all look slightly different so they all had their hair styled differently but all incorporating plaits which I did myself. I bought them each a pair of Pandora flower stud earrings to wear on the day that matched their dresses. The morning of the wedding Grant had bought me & all the girls a large white umbrella in case it rained which was so thoughtful. 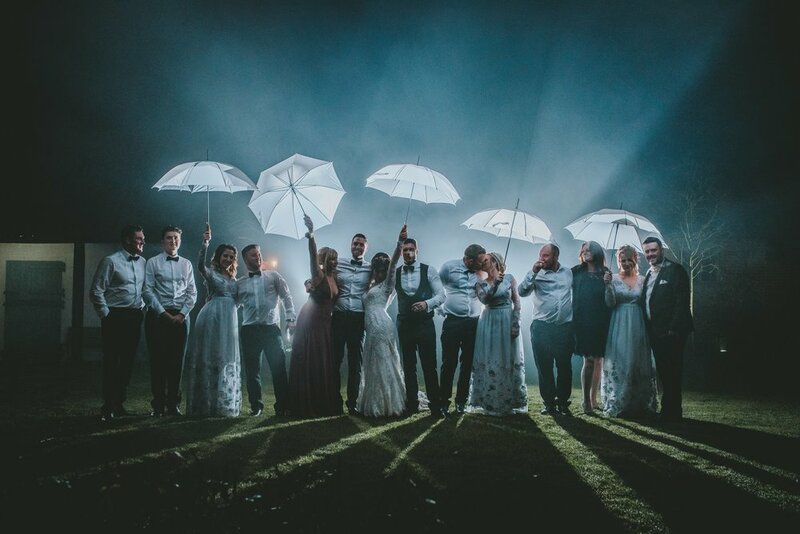 Luckily the weather held out & we didn’t need them but we did use them to have some great photos taken in the evening which was a lot of fun. I had such an amazing day & having my 4 special girls to share it with made it all the more perfect. 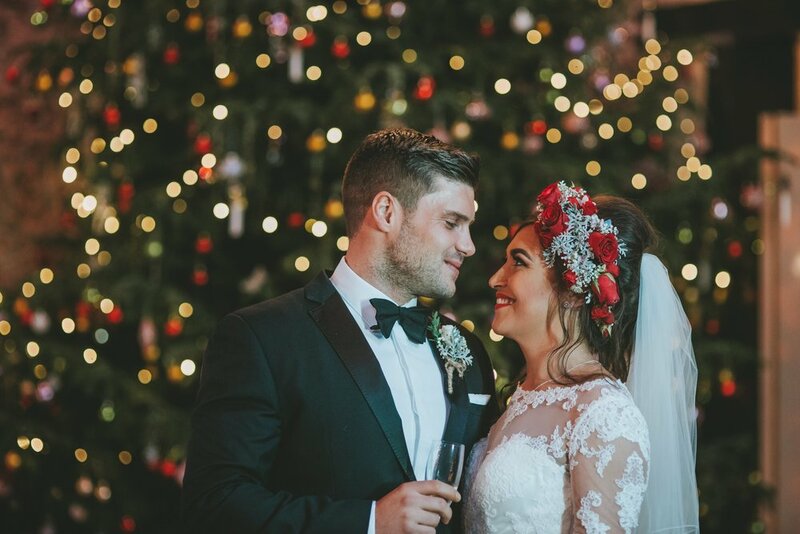 Grant & I both love Christmas so much so we knew we wanted a Christmassy, winter wedding & we wanted a venue that would look beautiful in the colder months. 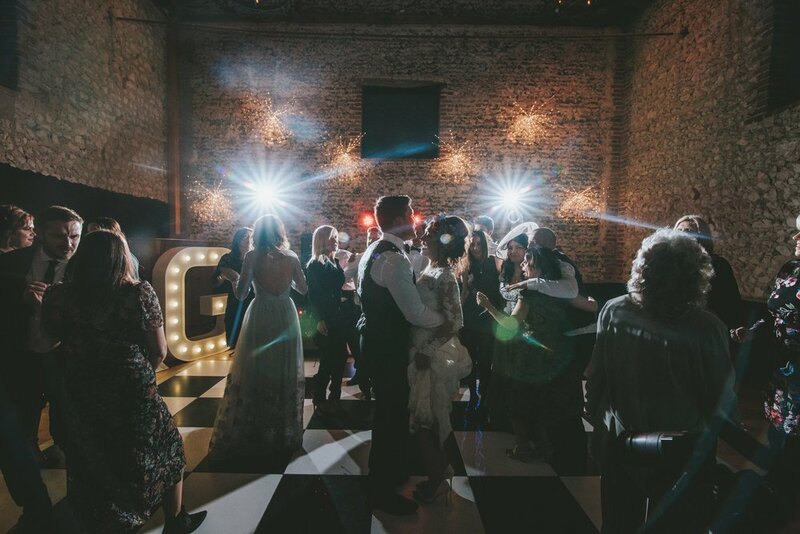 The Granary Barns was the first & only venue we looked at & as soon as we saw it we knew it was where we wanted our reception. 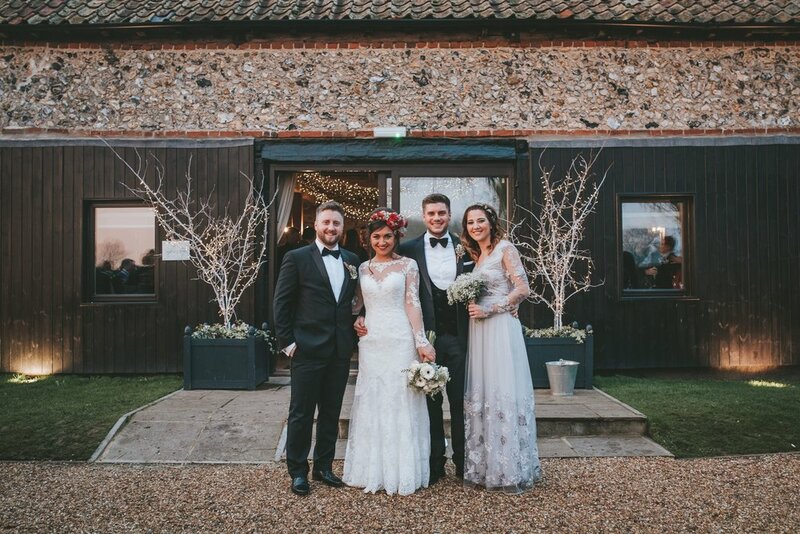 We loved the huge barn with flint walls & thought it would go perfectly with our winter, rustic theme. 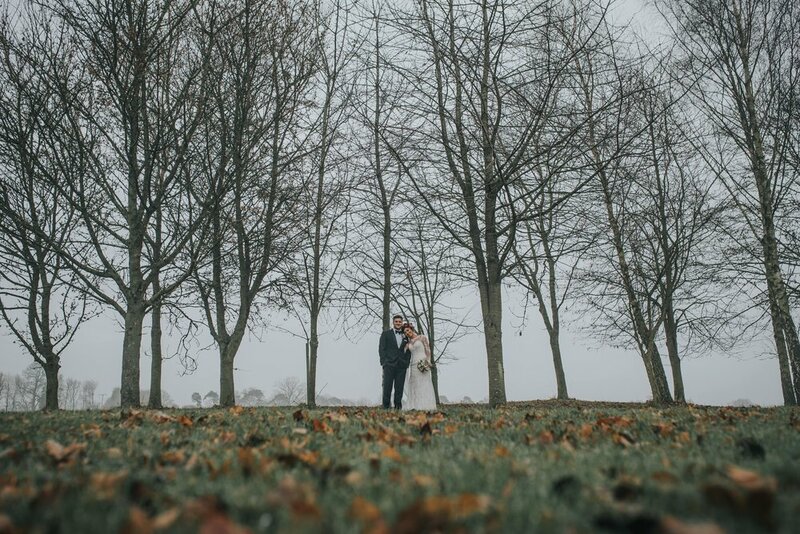 The grounds are so gorgeous too & with all the trees we pictured them looking gorgeous in our winter wedding photos. 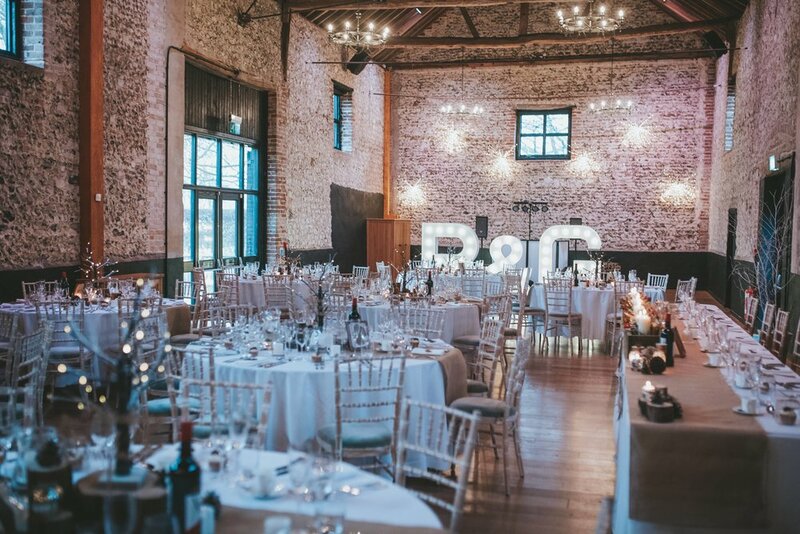 I had no colour palette in mind when planning the wedding I just knew I wanted it all very natural & rustic with lots of greenery, hessian & candles. 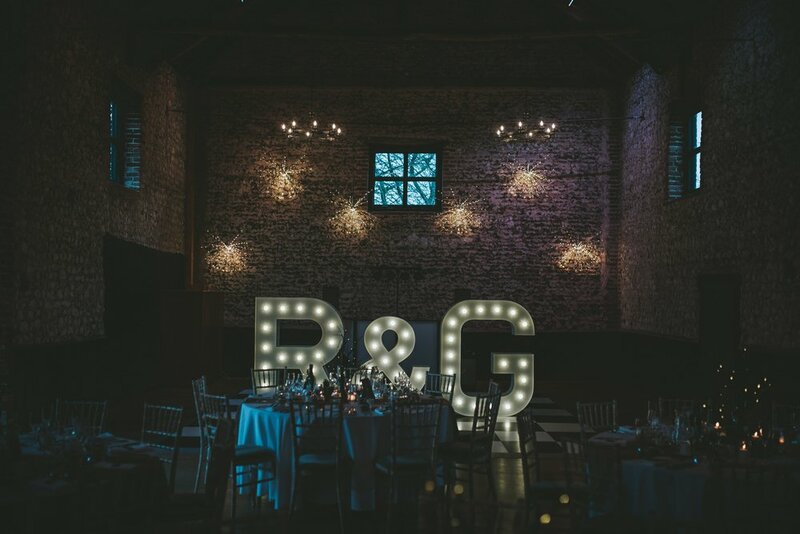 The small barn was decorated with fairy lights provided by the barns & I provided 2 large free standing silver stags which the GG’s placed in front of the large mirror which looked gorgeous as you walked in. I had lots of small decorative tables that had lots of candles in lace jars. We also used the Granary’s wooden ladder to display framed ‘love’ quotes from my favourite Disney films. 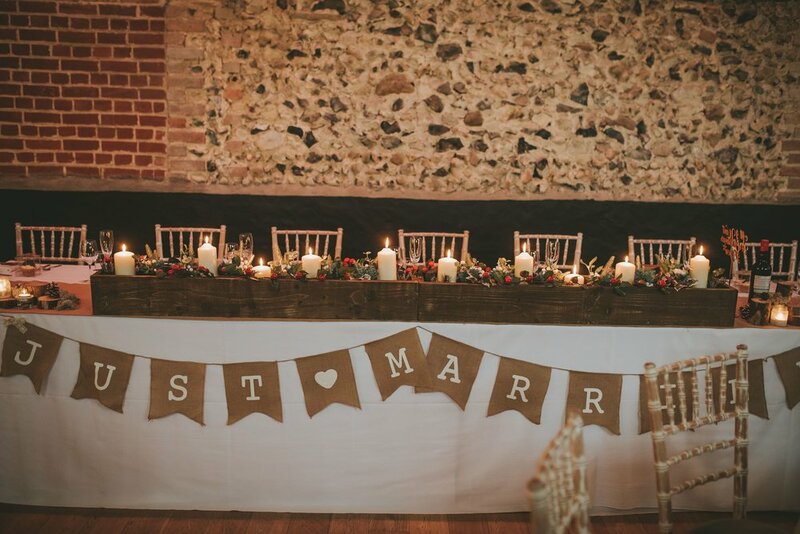 In the large barn the tables all had hessian runners & had lit up twig trees on log plates as centre pieces surrounded by lots of candles & pinecones. We named each table after one of our favourite Christmas songs, these were displayed on wooden stands in the middle of the tables, and they matched everyone’s name cards which were also made from wood. The top table centre pieces were made by Grant. They were long planters that had lots of large pillar candles in surrounded by pinecones, ivy & holly leaves & winter berries. 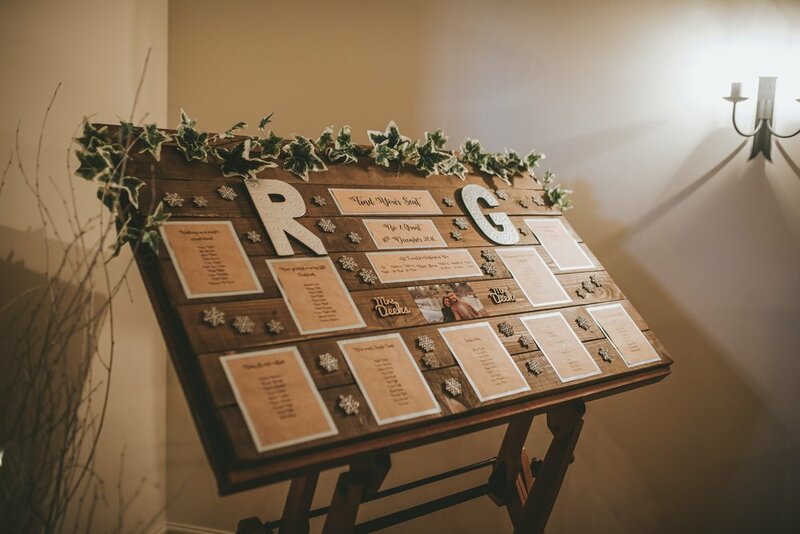 Grant also made our table plan which was a large wooden plank surrounded by ivy & decorated with snowflakes. We wanted something different to a guestbook so Grant made a wooden guest board that I decorated with our names & wedding date & everyone signed it with white sharpie pens. The barns all came together so beautifully on our day, we really couldn’t have imagined it to be so perfect. 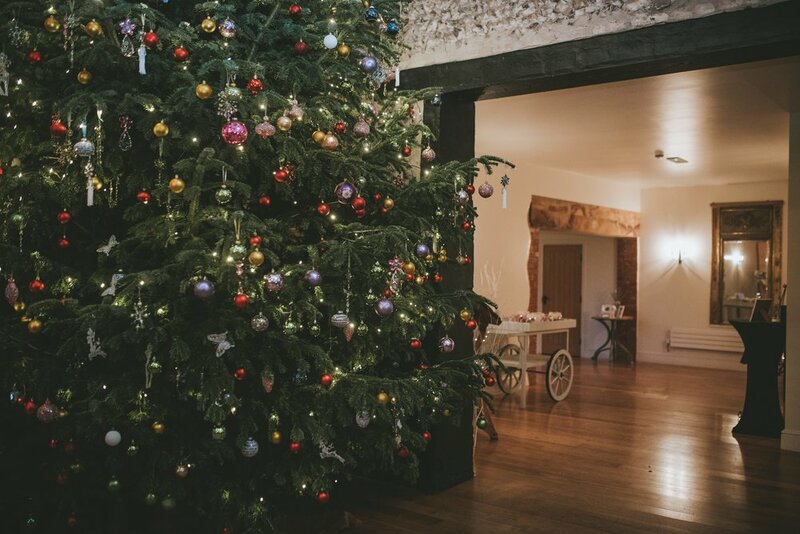 One of the massive talking points of the day was the ginormous Christmas tree in the large barn, it was absolutely stunning & it completely made our Christmas wedding perfect. It looked amazing in our wedding photos too. Fiona Pilcher did our wedding flowers. The bridesmaids all had large bouquets of gypsophila tied in hessian bows & the groomsmen had matching buttonholes also tied with hessian. Grant & his best man had white roses with some winter greenery. My bouquet was a mix of white roses, pinecones & winter greens all to tie in with the other flowers. My favourite flowers from the day were the red roses I had on my head piece. I absolutely loved them & they finished off my wedding outfit. Grant & I always knew we wanted a church ceremony in the village where we live. It means a lot to us as its where my parents were married & it is where Grants Father lays to rest. With that in mind it was always going to be very emotional for us. The morning of the wedding was so exciting for us both & it just flew by. The nerves for me really kicked in during the time I was alone with my Dad waiting for the car to collect us. I think this is also when the nerves kicked in for Grant too especially as I was nearly half an hour late! When I stood outside the church waiting to go in with my Dad I was extremely nervous & emotional, I could barely hold back the tears. I was actually like that throughout most of the ceremony. One very poignant moment for us was the giving of the rings. Grants wedding ring was made from the gold of his father’s wedding band so that was very special to him & a very emotional moment for me when I gave it to him. 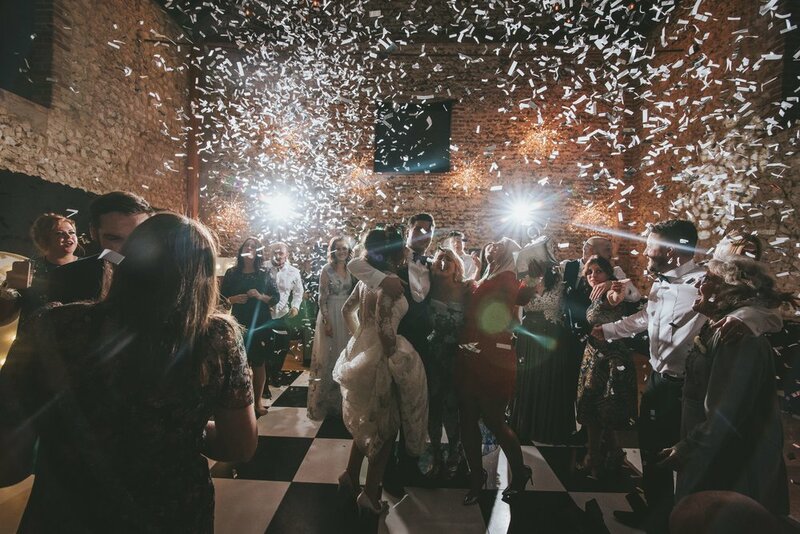 Once the ceremony was finished turning around to all of our family & friends smiling, clapping & cheering was such an amazing feeling & walking down the aisle as Mr & Mrs is a moment I will never forget. To start we had ham hock with homemade piccalilli & quails egg. For the main we wanted a traditional Christmas dinner but to make it a little different we had the joints of pork served on a wooden board at the tables & 1 guest from each table was given an apron with their name on & asked to carve the meat for everyone. This was a lot of fun & had everyone up & talking. To finish off we had Grant’s favourite, sticky toffee pudding with butterscotch sauce. We also gave each guest their own individually wrapped Terry’s chocolate orange cupcake. For our evening food we had sausage, bacon & fish goujon baps with little pots of chips being handed around to guests in baskets. Everyone loved this idea. The caterers were also kind enough to wrap up some food for Grant & me to take back to the hotel with us. We had been so busy with our guests so had no time to eat anything so this was lovely. 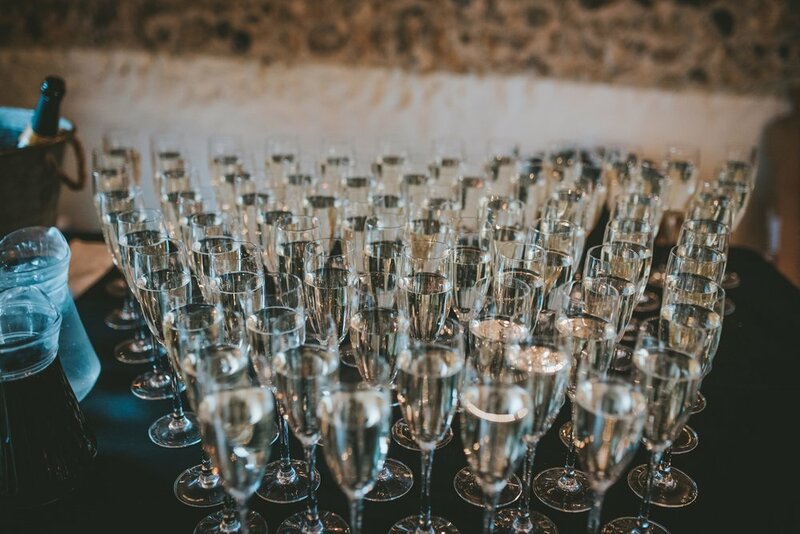 We had a fantastic party with around 60 additional evening guests coming along. We loved how the dance floor & the bar were all in the same room as it meant everyone mingling in the same area all night. It was also lovely not having to move tables to clear the dance floor as guests could sit around & watch others dancing. 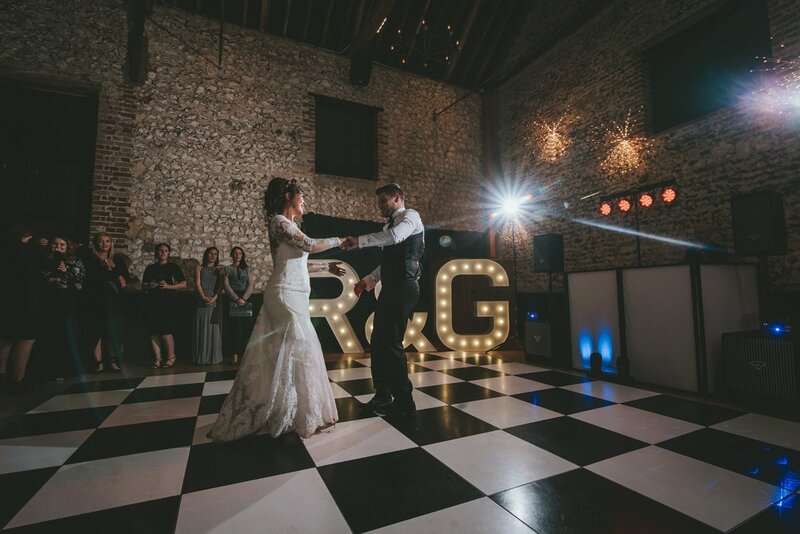 We used the company Letterhire.com to have a huge lit R & G on the dance floor which looked great as you walked into the barn & went lovely with the black & white dance floor. We had Soundwaves Disco DJ for our evening entertainment & he did great at playing ours & the guest’s favourite songs. 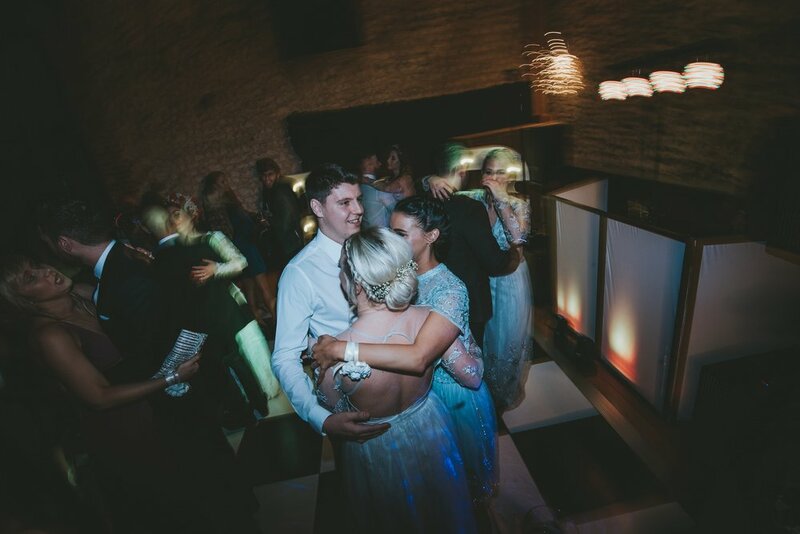 For our first dance we had the song ‘Let’s Stay Together’ by Al Green. We always knew we would use this as it had been ‘our song’ for years. It even started playing the first time we went to taste our wedding menu. We had such a great time during our party, lots of laughs & dancing with our friends. It would be amazing to relive the whole day! 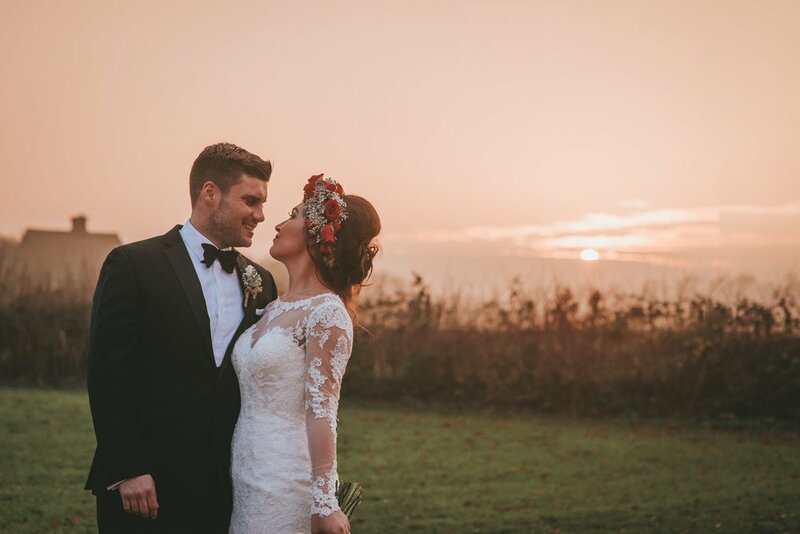 We used Tom Halliday for our wedding photography & he was the perfect choice. He had done a couple of friend’s weddings before & when we saw his pictures they were just stunning. They looked so different to any other photos we had seen. They looked more like art rather than the generic wedding photos we often see. We had so many compliments from guests at how gorgeous our photos were. During the evening Tom put up a slide show of photos he had taken of us for all our guests to see which was a lovely touch. When we first saw the photos we were over the moon. Since having them I have created a wedding album myself using a website & we have a huge collage of framed photos on our wall at home. It would be so hard to just pick a couple so we went with lots instead. One thing I would say to any future bride & groom’s is if you have it in your budget to get a videographer definitely do so. The wedding day goes so quickly & having a video to watch back really brings the whole day back to you. 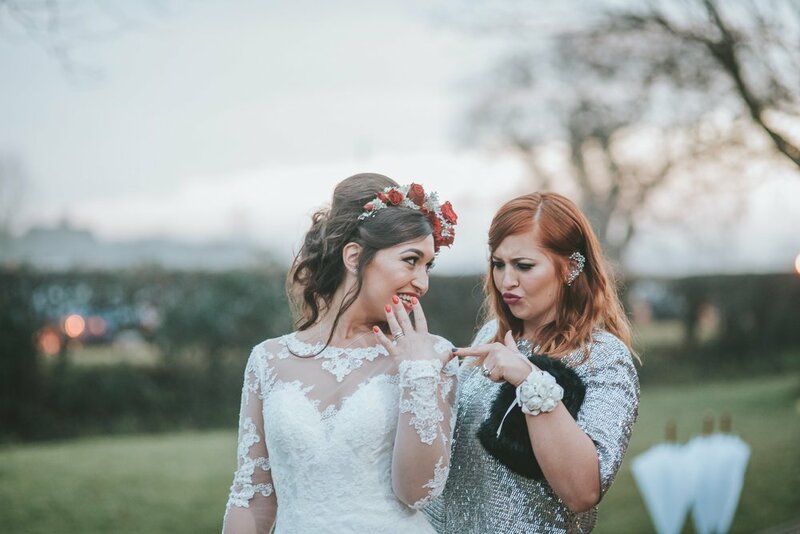 It’s especially lovely being able to re-listen to the speeches & see your wedding from others point of view. We cannot believe our wedding day was almost a year ago. The year has just flown by so quickly. Looking back on our day there is honestly nothing we would change. The day ran so smoothly & everything looked so beautiful. All our guests along with ourselves had such an amazing day filled with love & laughter. It really was our dream wedding. It couldn’t have been more perfect. Newer PostA night to remember! Older PostBambinos at The Barns!